Fas (CD95)-mediated apoptosis is an essential mechanism for the maintenance of homeostasis, and disruption of this death pathway contributes to many human diseases. The cell survival protein kinase Akt/protein kinase B (PKB) is a known regulator of apoptosis, but its role in Fas-mediated cell death and its regulatory mechanisms are unclear. In this study, we show that stimulation of the Fas receptor by its ligand (FasL) induces rapid phosphorylation of Akt/PKB and a parallel increase in cell apoptosis in epidermal Cl41 cells. Inhibition of PI3K/Akt by dominant-negative overexpression of PI3K (Δp85) and Akt (Akt-T308A/S473A) protects the cells from apoptosis, indicating an unexpected proapoptotic role of PI3K/Akt in the Fas signaling process. Treatment of the cells with pharmacological inhibitors of PI3K, wortmannin and 2-(4-morpholinyl)-8-phenyl-4H-1-benzopyran-4-1 (LY294002), similarly inhibits FasL-induced apoptosis and Akt/PKB phosphorylation, indicating that PI3K is an upstream mediator of Akt/PKB and is involved in Fas-mediated cell death. Electron spin resonance studies show that FasL treatment induces rapid generation of reactive oxygen species, and inhibition of ROS by antioxidants effectively inhibits Akt/PKB signaling, suggesting that FasL activation of Akt/PKB is redox sensitive. In cells transfected with dominant-negative PI3K/Akt, Fas expression is down-regulated, but FLIP expression is unaffected. Reporter gene and mRNA expression assays show that FasL activates fas transcriptional activity and this effect is inhibited by PI3K/Akt suppression. Together, our results indicate that the PI3K/Akt, in addition to its normal prosurvival role, also plays an apoptotic role in Fas-mediated cell death through a mechanism that involves transcriptional activation of Fas receptor. Fas (APO-1, CD95) is an apoptosis-inducing molecule that belongs to the TNFR superfamily (1, 2). Activation of Fas receptor by its ligand (FasL)3 triggers a complex cascade of intracellular events that require Fas-associated death domain adapter protein and the formation of death-inducing signaling complex, leading to caspase-8 activation and cell apoptosis (3, 4). Fas-mediated apoptosis is an essential mechanism for the maintenance of homeostasis in multicellular organisms, and disruption of the Fas/FasL system can lead to lymphoproliferative disorders (5), autoimmune diseases (6, 7), abnormal wound healing, and skin disorders (8, 9, 10). The Fas/FasL system also plays important roles in various apoptosis conditions, such as those evoked by antitumor agents, viral infections, and irradiation (11, 12, 13, 14). The serine/threonine protein kinase Akt/protein kinase B (PKB) promotes viability in various cell types. Activation of Akt/PKB involves the binding of PI3K-generated phosphoinositides to Akt via its pleckstrin homology domain (15). PI3K-dependent activation of Akt also involves 3′ phosphoinositide-dependent kinase-1-mediated phosphorylation of threonine 308, leading to the autophosphorylation of Ser473 (16). Cells use PI3K/Akt as survival pathways to regulate several cellular effectors of apoptosis, which include phosphorylation-dependent inhibition of proapoptotic signals of proteins such as Bcl-2-associated death (BAD) protein, caspase-9, and the family of forkhead transcription factors (17, 18, 19). Additionally, Akt/PKB has been reported to promote cell survival via activation of NF-κB-dependent expression of antiapoptotic genes such as FLIP and inhibitors of apoptosis, and suppress mitochondrial pathways for apoptosis (20, 21, 22). PI3K/Akt has also been implicated in the regulation of proapoptotic signals in the death receptor pathways. For example, ligation of Fas receptor induces tyrosine phosphorylation and activates PI3K/Akt, which is required for Fas-mediated cell death (23). Induced expression of Akt or p110, the catalytic subunit of PI3K, increases Fas transcriptional activity (24), suggesting the positive regulation of PI3K/Akt on Fas death signaling. In contrast, elevated PI3K/Akt expression has been associated with increased survival and carcinogenicity in human tumors. Epidermal growth factor stimulation of breast adenocarcinoma and embryonic kidney epithelial cells protects the cells from Fas-mediated apoptosis (25). Thus, Akt/PKB plays both pro- and antiapoptotic role in Fas-mediated cell death depending on cell type and pathologic conditions. Recent studies have shown that activation of Akt/PKB by growth factors is dependent on reactive oxygen species (ROS) generation, and that phosphorylation of this enzyme by growth factors is redox sensitive (26). Akt is also activated during oxidative stress as well as several other stresses known to exert their cytotoxic effects through the generation of ROS or perturbations in cellular redox status (27, 28, 29, 30, 31). ROS have also been implicated in the transmission of death signal produced by Fas. Ligation of Fas receptor by FasL or agonistic anti-Fas Ab induces ROS generation in some cells, and inhibition of these oxidative species by antioxidants negates the apoptotic effect of FasL (32, 33). These findings raise the possibility that Akt/PKB may be activated by FasL in a redox-sensitive manner and that this signaling pathway may be involved in Fas-mediated cell death. The present study was undertaken to determine whether: 1) FasL activates PI3K/Akt in epidermal Cl41 cells; 2) ROS play a role in this process; and 3) FasL activation of PI3K/Akt plays a role in apoptotic cell death, and, if so, by what mechanism. The dominant-negative mutant PI3K plasmid (Δp85), the Akt mutant plasmid (SRα-Akt-T308A/S473A), and the CMV-neo vector plasmid were a gift from C. Huang (New York University, Tuxedo, NY), as previously described (31, 34). The Fas reporter plasmid (Fas-Luc) and control plasmid (pGL2B) were from H. Chan (University of Texas M.D. Anderson Cancer Center, Houston, TX) (35), and the dominant-negative Rac1 plasmid (myc-tagged Rac1N17) was a gift from C. Stehlik (West Virginia University Cancer Center, Morgantown, WV). Recombinant Fas ligand (SuperFasL), anti-Fas, and anti-FLIP Abs were obtained from Alexis Biochemicals. Phospho-specific Akt (Ser473), Akt, and β-actin Abs were purchased from Cell Signaling Technology. Wortmannin and 2-(4-morpholinyl)-8-phenyl-4H-1-benzopyran-4-1 (LY294002) were obtained from Calbiochem. LipofectAMINE was from Invitrogen Life Technologies, and catalase and superoxide dismutase were from Boehringer Mannheim. All other chemicals and reagents, including deferoxamine, 5,5-dimethyl-1-pyrroline-N-oxide (DMPO), and hydroethidine, were obtained from Sigma-Aldrich. The epidermal Cl41 cell line was originally established by N. Colburn (National Cancer Institute, Frederick, MD) (36). The cells and their PI3K/Akt and Rac1 dominant-negative transfectants were cultured in monolayers at 37°C, 5% CO2 using MEM containing 5% FBS, 2 mM l-glutamine, and 25 μg/ml gentamicin. Stable transfectants were generated by culturing Cl41 cells in a 6-well plate until they reached 80–90% confluence. A total of 1 μg of CMV-neo vector and 15 μl of LipofectAMINE reagent with 2 μg of dominant-negative mutant (SRα-Akt T308A/S473A, Δp85, or Rac1N17) was used to transfect the cells in each well in the absence of serum. After 10 h, the medium was replaced with 5% FBS MEM. Approximately 36 h after the beginning of the transfection, the cells were digested with 0.03% trypsin, and the cell suspensions were plated onto 75-ml culture flasks and cultured for 24–28 days with G418 selection (400 μg/ml). Stable transfectants of PI3K, Akt, and Rac1 were identified by immunoblot and kinase activity assays, and were cultured in G418-free MEM for at least two passages before each experiment. Analysis of cell apoptosis was performed by using an ELISA DNA fragmentation assay kit (Roche Molecular Biochemicals) or by Hoechst 33342 staining assay. For the ELISA, cells were lysed with 200 μl of lysis buffer at room temperature, and the cell lysate (20 μl) was mixed with an Ab solution (80 μl) at room temperature for 2 h. The substrate was then added after the wells were washed three times with a washing buffer. After incubation for 10–20 min at 37°C, OD was measured using a microplate reader at a wavelength of 405 nm. For Hoechst staining, cells were incubated with Hoechst 33342 (10 μg/ml) for 30 min at 37°C and observed under a fluorescence microscope using Pixera software (Leica Microsystems). ESR spin-trapping technique was used to detect short-lived free radical intermediates. DMPO was used as a spin-trapping agent to form a relatively long-lived spin adduct. The intensity of the signal is used to measure the amount of short-lived radicals trapped, and the hyperfine couplings of the spin adduct are generally characteristics of the original trapped radicals. All ESR measurements were conducted at 37°C using a Varian E9 ESR spectrometer and a flat cell assembly. Reactants were mixed in a test tube in a final volume of 500 μl. The reaction mixture was then transferred to a flat cell for measurement. Hyperfine couplings were measured (to 0.1 G) directly from magnetic field separation using potassium tetraperoxochromate (K3CrO8) and 1,1-diphenyl-2-picrylhydrazyl as reference standards. Cells were washed with PBS twice and harvested by scraping. Cell lysates were prepared in cell lysis buffer (50 mmol/L Tris-HCl (pH 8.0), 20 mmol/L EDTA, 1% SDS, and 100 mmol/L NaCl) containing an enzyme inhibitor mixture tablet (Roche Molecular Biochemicals) and PMSF (Sigma-Aldrich). Protein concentration was determined using a protein assay kit (Bio-Rad). A total of 20–50 μg of protein extract was fractionated by SDS-PAGE and transferred to a polyvinylidene difluoride membrane (Immobilon-P; Millipore). The membrane was blocked with T-PBS (0.3% Tween 20 in PBS) containing 3% dry milk and incubated with primary Ab overnight at 4°C. After three washes with T-PBS, the membrane was incubated with HRP-conjugated secondary Ab for 1 h and then washed with 0.05% Tween 20 in PBS. The immune complexes were detected by ECL methods (Amersham Biosciences) and quantified using analyst/PC densitometry software (Bio-Rad). Mean densitometry data from independent experiments were normalized to result in cells in the control. The data were presented as the mean ± SE and analyzed by the Student’s t test. Subconfluent (80%) monolayers of Cl41 and dominant-negative Cl41-Δp85 and Cl41-Akt-T308A/S473A cells were cotransfected with 10 μg of either the fas promoter reporter plasmid (Fas-Luc) or empty reporter pGL2B plasmid and 10 ng of pRL-tk Renilla normalizing luciferase plasmid (Promega). The plasmids were mixed with LipofectAMINE (12 μg/ml) in MEM and added to the cells for 4 h, after which the medium was replaced with growth medium containing 10% FBS. After a 24-h recovery, transfected cells were treated with FasL for 12 h and cell extracts were prepared and analyzed for luciferase activity using the Promega dual-luciferase assay. Both firefly and Renilla luciferase activities were measured using a luminometer (Turner). Normalized reporter activity is expressed as the firefly luciferase value divided by the Renilla luciferase value. Relative fold activity is calculated as the normalized reporter activity of the test sample divided by the control reporter construct. For analysis of surface Fas expression, cells (5 × 105) were harvested, washed with PBS, and incubated with primary anti-Fas mAb (BD Pharmingen) for 1 h in PBS containing 0.5% BSA and 2 mM EDTA. The cells were then stained with biotin-linked anti-hamster IgG and PE-labeled streptavidin (BD Pharmingen) for 40 min. After washing with PBS, the cells were fixed with 1% formaldehyde for 30 min and then analyzed for Fas expression by FACS. FACS was performed on a FACSCalibur cytometer (BD Biosciences) with a gate set for examining a total of 104 cells. For analysis of superoxide anion (O2−·) generation, cells were incubated with the fluorescent probe hydroethidine (10 μM) for 30 min at 37°C, after which they were washed, trypsinized, resuspended in PBS (1 × 106/ml), and immediately analyzed for fluorescence intensity on the FACSCalibur. Hydroethidine is a specific dye for O2−·. It is oxidized by O2−· to form the fluorescent product ethidium (37). Total RNA was extracted with TRIzol reagent (Invitrogen Life Technologies), according to the manufacturer’s protocol. First-strand cDNA was synthesized using the SuperScript III synthesis system (Invitrogen Life Technologies) for RT-PCR. The reaction was conducted for 60 min at 42°C. The synthesized cDNA was amplified using specific sets of primers for fas and β-actin. The PCR were cycled as follows: after initial denaturation for 4 min at 99.9°C, 40 cycles at 94°C for 30 s, 58°C for 30 s, and 72°C for 30 s; final extension was conducted at 72°C for 5 min. The PCR products were electrophoresed in a 1.5% agarose gel, stained with ethidium bromide, and photographed. The stained bands were quantified using an analyst/PC densitometry software (Bio-Rad). To study the role of PI3K/Akt in Fas-mediated apoptosis, we first characterized the apoptotic cell death response to Fas stimulation by FasL in epidermal Cl41 cells. The cells were treated with different concentrations of FasL, and apoptosis was determined at various times after the treatment using ELISA-based DNA fragmentation assay. As shown in Fig. 1⇓A, FasL treatment caused a dose-dependent increase in apoptosis over nontreated control. Peak response time to apoptosis induction by FasL was ∼16 h (result not shown). Morphological analysis of cell apoptosis by fluorescence-based Hoechst assay showed a significant increase in apoptosis levels from 2 ± 1% to 38 ± 4% (bright fluorescence signals) after FasL treatment (100 ng/ml) (Fig. 1⇓, B and C). Induction of apoptosis and Akt/PKB phosphorylation by FasL. A, Subconfluent (80%) monolayers of epidermal Cl41 cells were exposed to FasL (0–200 ng/ml) for 16 h and analyzed for apoptosis by ELISA-based DNA fragmentation assay. B and C, Microscopic detection of apoptosis by Hoechst assay in control and FasL-treated Cl41 cells (100 ng/ml, 16 h). D, Western blot analysis of Akt phosphorylation in response to FasL treatment. Subconfluent monolayers of Cl41 cells were treated with FasL (100 ng/ml) at indicated times. The cells were then washed with ice-cold PBS and extracted with SDS sample buffer. The cell extracts were separated on polyacrylamide-SDS gels, transferred, and probed with phospho-specific Akt (P-Akt Ser473) Ab and Akt Ab. The immunoblot signals were quantified by densitometry. The mean densitometry data from independent experiments (one of which is shown here) were normalized to the result obtained in cells in the absence of FasL (control). 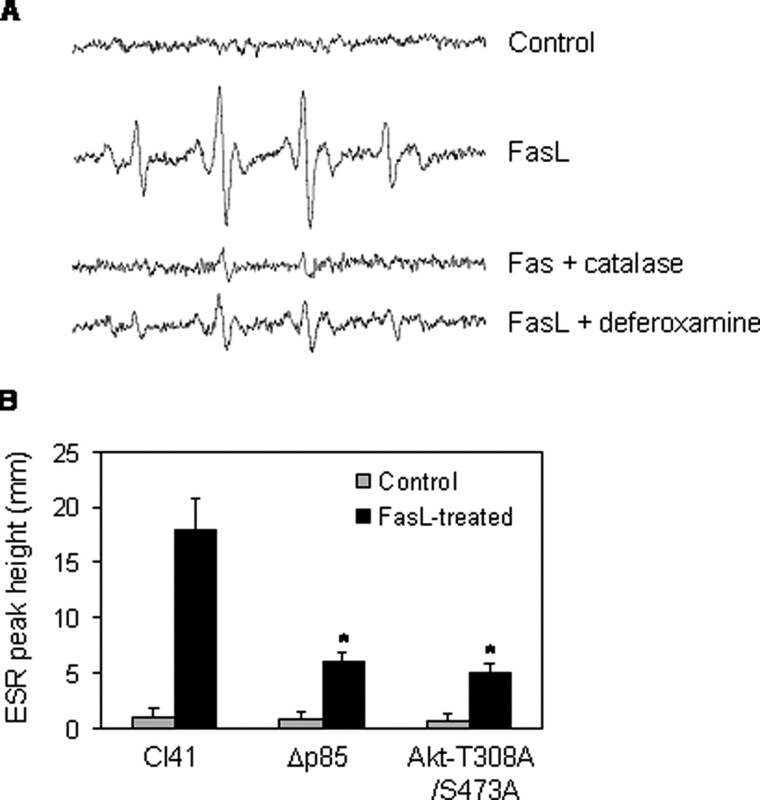 E, Dose effect of FasL on Akt phosphorylation. Cells were treated with various concentrations of FasL (0–200 ng/ml) for 1 h and analyzed for Akt phosphorylation. Plots are mean ± SE (n = 3). ∗, p < 0.05 vs control. To determine whether FasL could induce Akt/PKB activation, Cl41 cells were treated with FasL and, at various time points after the treatment, total cellular protein extracts were prepared and analyzed for phospho-specific Akt (Ser473) and total Akt proteins by immunoblot assays. As shown in Fig. 1⇑, D and E, the level of phosphorylated Akt was induced by the FasL treatment in a dose- and time-dependent manner, whereas the level of total Akt was relatively unchanged after FasL treatment. The maximum induction of Akt phosphorylation occurred ∼30 min after the addition of FasL. To determine the role of PI3K/Akt in FasL-induced apoptosis, we tested the effect of FasL in two Cl41 cell lines stably transfected with dominant-negative mutants of PI3K (PI3K-Δp85) and Akt (Akt-T308A/S473A). Apoptosis and Akt/PKB phosphorylation were determined in the two transfectants, and the results were compared with those of the normal Cl41 cells. As shown in Fig. 2⇓A, the two dominant-negative transfectants exhibited a reduced apoptotic response to FasL treatment as compared with the normal FasL-treated control cells. This result, which indicates a proapoptotic role of PI3K/Akt in Fas-mediated cell death, is somewhat surprising because PI3K/Akt has been widely regarded as a negative regulator of apoptotic cell death by various stimuli. To confirm this result, morphological analysis of cell apoptosis by Hoechst assay and PI3K/Akt activation studies were performed. Fig. 2⇓, B–G, shows that in the absence of FasL, the normal and transfected cell lines exhibited similarly low levels of apoptosis in the range of 1–2%. Upon FasL treatment, apoptosis levels were significantly increased in all cell systems, but the increase in normal Cl41 cells (42 ± 5%) was substantially higher than that in PI3K-Δp85- and Akt-T308A/S473A-transfected cells (8 ± 2% and 6 ± 2%, respectively). Immunoblot analysis of the cell extracts from these experiments showed an inhibition of FasL-induced Akt/PKB phosphorylation in the two transfectants compared with the control Cl41 cells (Fig. 2⇓H). These results indicate the protective effect of PI3K/Akt inhibition on FasL-induced apoptosis. 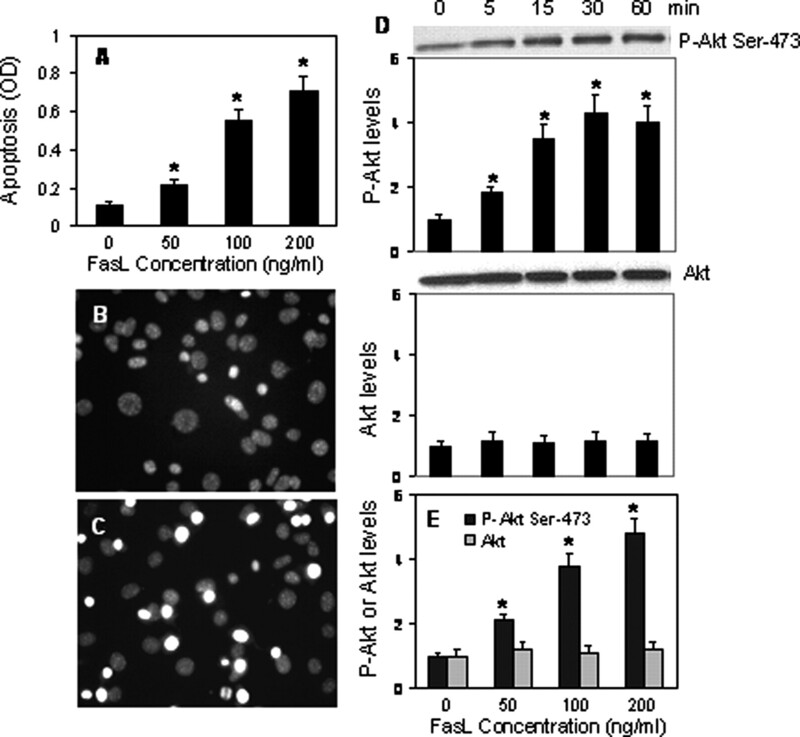 Effects of dominant-negative PI3K/Akt on FasL-induced apoptosis and Akt phosphorylation. A, Subconfluent (80%) monolayers of Cl41 cells or Δp85- or Akt-T308A/S473A-transfected Cl41 cells were treated with FasL (100 ng/ml, 16 h). The cells were then analyzed for apoptosis by ELISA-based DNA fragmentation assay. B–G, Hoechst assay of apoptosis in the three cell systems under the same treatment conditions described above. H, Western blot analysis of phosphorylated Akt in Cl41, Cl41-Δp85, and Cl41-AktT308A/S473A cells. The cells were treated with FasL (100 ng/ml) for 30 min, after which they were washed with PBS and extracted with SDS sample buffer. The cell extracts were separated on 10% polyacrylamide-SDS gels, transferred, and probed with phospho-specific Akt (P-Akt Ser473) Ab and β-actin Ab. β-Actin was used as a loading control. The immunoblot signals were quantified by densitometry. Plots are mean ± SE values of P-Akt/β-actin intensity ratios from three independent experiments. The ratio in unstimulated cells was defined as 1.0 (control). ∗, p < 0.05 vs control. To confirm the protective effect of PI3K/Akt inhibition on FasL-induced apoptosis, we used two well-known chemical inhibitors of PI3K, LY294002 and wortmannin. Cl41 cells were treated with FasL in the presence or absence of the two inhibitors, and apoptosis and Akt phosphorylation were similarly determined. As shown in Fig. 3⇓A, both LY294002 and wortmannin were able to inhibit apoptosis induced by FasL in a dose-dependent manner. The two inhibitors also inhibited phosphorylation of Akt Ser473 induced by FasL (Fig. 3⇓B), suggesting that FasL-induced Akt phosphorylation was through PI3K activation and further confirming the proapoptotic role of PI3K/Akt in Fas-mediated apoptosis. Effects of PI3K inhibitors on FasL-induced apoptosis and Akt activation. A, Epidermal Cl41 cells were pretreated with LY294002 (0–20 μM) or wortmannin (0–100 nM) for 30 min before exposure to FasL (100 ng/ml) for 16 h. Apoptosis was determined by ELISA-based DNA fragmentation assay. B, Cl41 cells were treated with FasL (100 ng/ml, 30 min) with or without LY294002 (20 μM) or wortmannin (100 nM) pretreatment, and Western blot analysis of P-Akt Ser473 was performed. Values are means ± SE for three independent experiments. ∗, p < 0.05 vs FasL-treated control. ROS generation has been implicated as a key signaling event in PI3K/Akt activation (26, 27, 28, 29, 30, 31). To determine whether FasL could induce PI3K/Akt activation and apoptosis through ROS, we measured ROS generation in FasL-treated cells by ESR using DMPO as a spin trap. Fig. 4⇓A shows that in the absence of FasL stimulation, minimum ESR signal was observed in the control Cl41 cells. Upon FasL treatment (100 ng/ml), a clear positive signal was observed. The ESR spectrum consists of a 1:2:2:1 quartet with hyperfine splittings of aH = aN = 14.9 G, in which aN and aH denote hyperfine splitting of the nitroxyl nitrogens and α-hydrogen, respectively. Based on the hyperfine splitting and line shape, the spectrum was assigned to the DMPO-hydroxyl radical (·OH) adduct, which was evidence of ·OH generation. Addition of catalase (hydrogen peroxide (H2O2) scavenger) effectively inhibited the signal intensity, indicating that H2O2 was generated in FasL-treated cells and that this oxidative species was a precursor for ·OH generation, i.e., through a Fenton-like reaction (Fe2+ + H2O2 → Fe3+ + ·OH + OH−). Addition of deferoxamine, a known ·OH scavenger, also decreased the signal intensity, further supporting the generation of ·OH by FasL. ESR measurements of FasL-induced ROS generation and its inhibition by antioxidants. A, ESR spectra were recorded at 30 min after the addition of the spin trapper DMPO (100 mM) to Cl41 cells (1 × 106/ml) with or without (control) the following agents: FasL (100 ng/ml), catalase (1000 U/ml), and deferoxamine (1 mM). B, Experiments were repeated in Cl41-Δp85 and Cl41-AktT308A/S473A cells (1 × 106/ml) with or without (control) FasL (100 ng/ml). The spectrometer settings were as follows: receiver gain at 1.5 × 105, time constants at 0.3 s, modulation amplitude at 1.0 G, scan time at 4 min, magnetic field at 3470 ± 100 G. Values are means ± SE for three independent experiments. ∗, p < 0.05 vs Cl41-treated control. To determine whether FasL-induced ROS generation is affected by PI3K/Akt inhibition, ESR experiments were performed in dominant-negative Cl41 PI3K-Δp85 and Cl41 Akt-T308A/S473A cells. Fig. 4⇑B shows that FasL-induced ROS generation was substantially reduced in the dominant-negative cells as compared with the control Cl41 cells. These results indicate the involvement of PI3K/Akt in the cellular ROS response to FasL stimulation. Subsequent studies further showed that inhibition of PI3K/Akt by the dominant-negative gene expression caused a reduction in Fas receptor expression, which may contribute to the observed decrease in ROS generation, presumably due to limited Fas-FasL interactions. To determine whether ROS generated by FasL play a role in PI3K/Akt signaling and apoptosis, we tested the effects of antioxidant enzyme catalase and superoxide dismutase (SOD) on FasL-induced apoptosis and Akt phosphorylation. As shown in Fig. 5⇓, the two antioxidant enzymes inhibited both FasL-induced apoptosis and Akt phosphorylation, indicating the role of ROS in PI3K/Akt signaling and apoptosis induced by FasL. Effects of antioxidant enzymes on FasL-induced apoptosis and Akt phosphorylation. A, Epidermal Cl41 cells were pretreated with catalase (1000 U/ml) or SOD (1000 U/ml) for 30 min before exposure to FasL (100 ng/ml, 16 h). Apoptosis was then determined by ELISA-based DNA fragmentation assay. B, Cl41 cells were similarly treated with the agents indicated above, and Akt phosphorylation was determined 30 min after FasL treatment by Western blotting. Values are means ± SE (n = 3). ∗, p < 0.05 vs nontreated control. ∗∗, p < 0.05 vs FasL-treated control. To provide a mechanistic basis for the PI3K/Akt regulation of Fas death signaling, we studied the effect of PI3K/Akt inhibition on key apoptosis proteins, Fas and FLIP, which are known to be important in Fas-mediated cell death. These two proteins have also been reported to be under the regulation of Akt/PKB (21, 38). We determined the expression levels of these two proteins in normal and dominant-negative PI3K/Akt Cl41 cells by immunoblot assays. Our results in Fig. 6⇓A show that the expression level of Fas in the dominant-negative cells was substantially lower than that in the normal Cl41 cells, the effect that was observed in both FasL-treated and nontreated cells. In contrast, the expression of FLIP was relatively unchanged in dominant-negative cells compared with the normal cells, and their expression level was similarly affected by the FasL treatment. These results indicate that Fas expression in Cl41 cells is regulated by PI3K/Akt and that down-regulation of this death receptor protein by PI3K/Akt inhibition may be a key mechanism contributing to the decreased sensitivity to FasL-induced cell death observed in Figs. 2⇑ and 3⇑. Effects of dominant-negative PI3K/Akt on Fas and FLIP expression. A, Subconfluent (80%) monolayers of Cl41, Cl41-Δp85, and Cl41-Akt-T308A/S473A cells were either left untreated or treated with FasL (100 ng/ml) for 6 h. The cells were lysed and extracted, and the cell lysates were separated on polyacrylamide-SDS gels, transferred, and probed with Abs specific for Fas, FLIP, and β-actin. B, Surface Fas expression in Cl41, Cl41-Δp85, and Cl41-Akt-T308A/S473A cells. Fas receptor expression was determined by FACS analysis, as described in Materials and Methods. Plots are mean ± SE values of three independent experiments. ∗, p < 0.05 vs Cl41 control. To confirm the inhibitory effect of PI3K/Akt suppression on Fas expression, we determined cell surface Fas expression in normal and dominant-negative PI3K/Akt Cl41 cells by FACS analysis. Fig. 6⇑B shows that surface Fas expression was indeed decreased in the two dominant-negative cell transfectants as compared with normal control cells. These results support our Western blot data and indicate the role of PI3K/Akt in the regulation of Fas receptor expression in Cl41 cells. The small GTP-binding protein Rac1 is involved in the activation of NADPH oxidase and generation of O2−· in various cell types (39, 40, 41). Inhibition of Rac1 by dominant-negative Rac1 expression has also been shown to inhibit O2−. generation induced by a variety of stimuli (40, 41, 42). To test whether Rac1 might play a role in the regulation of ROS generation and Fas expression in Cl41 cells, we stably transfected the cells with a dominant-negative Rac1 (myc-Rac1N17) or control plasmid and their effects on Fas expression and O2−· production were examined by flow cytometry. The transfected cells were also analyzed for myc-Rac1N17 protein expression by Western blot analysis. Fig. 7⇓A shows that transfection of the cells with the dominant-negative plasmid, but not the control plasmid, resulted in an increased expression of myc-Rac1N17 protein. Flow cytometric analysis of Fas expression, however, showed no significant difference in the levels of Fas receptor expression in the control and dominant-negative cells (Fig. 7⇓B). Using hydroethidine as a fluorescent probe for O2−·, we also found no significant difference in O2−· levels in the two cell transfectants (Fig. 7⇓C). When the cells were stimulated with FasL, a significant increase in O2−· production was observed in both cell transfectants, but the effect was more pronounced in the control transfectant (Fig. 7⇓C). These results indicate that FasL was able to induce O2−· generation in Cl41 cells and that this free radical generation is mediated in part by Rac1. Effects of dominant-negative Rac1 on Fas expression and ROS production. Cl41 cells were stably transfected with a myc-tagged Rac1N17 or a control (pcDNA3) plasmid, as described in Materials and Methods. A, Cell lysates from the two transfectants were prepared, separated on 10% polyacrylamide-SDS gels, transferred, and probed with an Ab to myc. The blot was reprobed with β-actin Ab as a loading control. 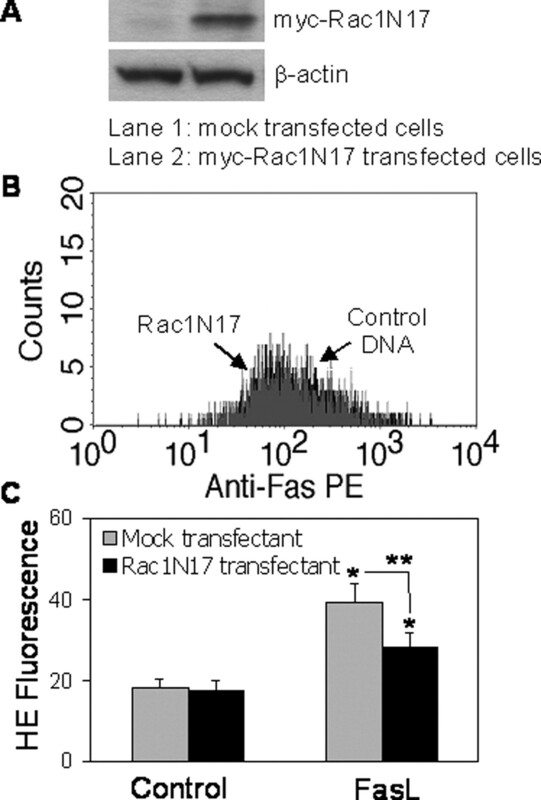 B, Control and Rac1N17-transfected cells were analyzed for surface Fas receptor expression by FACS. C, O2−. generation in control and Rac1N17-transfected cells was determined by FACS using hydroethidine (HE) as a fluorescent probe. The cells were either left untreated or treated with FasL (100 ng/ml) for 30 min, and hydroethidine fluorescence was determined. Plots are mean ± SE values of three independent experiments. ∗, p < 0.05 vs nontreated control. ∗∗, p < 0.05 vs FasL-treated control transfectant. To determine the mechanism of PI3K/Akt regulation of Fas expression, we conducted a reporter gene assay in which normal and PI3K/Akt dominant-negative cells were transiently transfected with a reporter plasmid carrying the fas promoter (Fas-Luc) or control reporter plasmid (pGL2B). The cells were then treated with FasL, and their luciferase activity was determined and compared. Fig. 8⇓A shows that in normal Cl41 cells, FasL treatment resulted in a substantial increase in Fas-dependent luciferase activity, whereas a similar FasL treatment in dominant-negative cells had minimal effect on the luciferase activity. These results indicate that FasL was able to activate fas promoter, and that this activation is regulated by PI3K/Akt. The role of PI3K/Akt in the regulation of fas expression was also determined by analyzing fas mRNA expression in normal and PI3K/Akt dominant-negative cells. Fig. 8⇓B shows that fas mRNA expression was substantially lower in the PI3K/Akt dominant-negative cells as compared with normal Cl41 cells. These results strongly support the role of PI3K/Akt in the transcriptional regulation of fas in Cl41 cells. Effects of dominant-negative PI3K/Akt on fas promoter activity and mRNA expression. 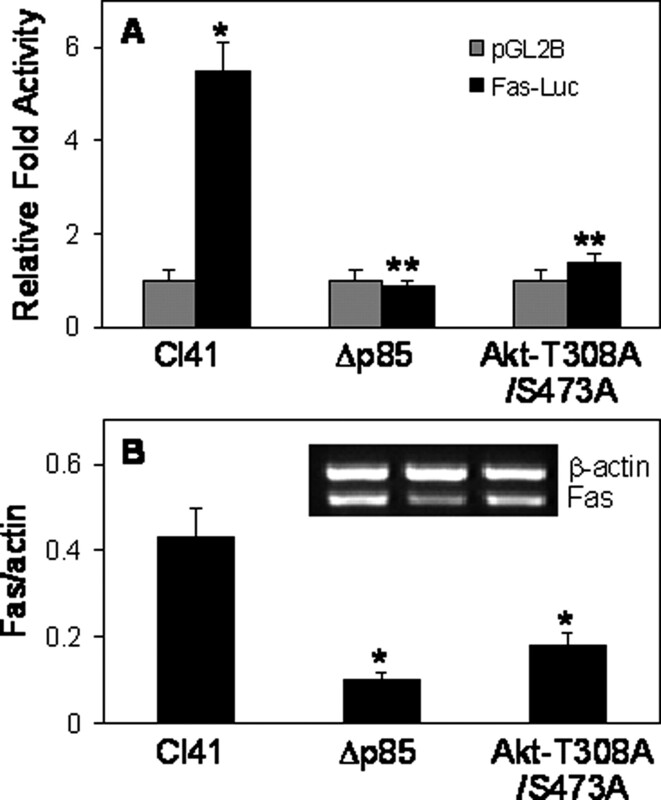 A, Activation of fas promoter activity by FasL and its inhibition by dominant-negative PI3K/Akt. Subconfluent (80%) monolayers of Cl41, Cl41-Δp85, and Cl41-Akt-T308A/S473A cells were transfected with 10 μg of either the fas promoter reporter plasmid (Fas-Luc) or empty reporter plasmid (pGL2B); 10 ng of pRL-tk plasmid was cotransfected for normalization. Transfected cells were treated with FasL (100 ng/ml) for 12 h, and cell extracts were prepared and determined for luciferase activity. Relative fold activity was calculated as the normalized Fas-Luc activity divided by the normalized pGL2B value. Plots are mean ± SE values of three independent experiments. ∗, p < 0.05 vs Cl41 pGL2B control. ∗∗, p < 0.05 vs Cl41 Fas-Luc control. 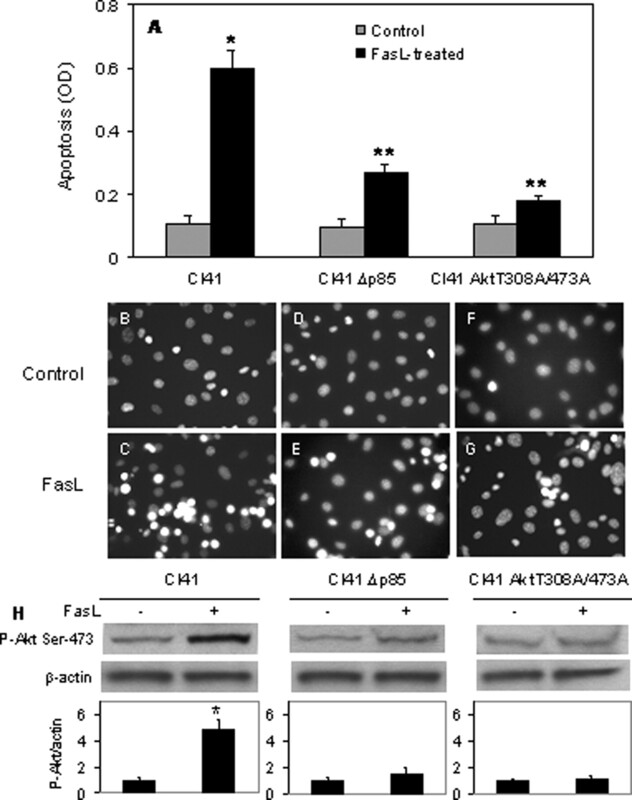 B, Determination of fas mRNA expression in Cl41, Cl41-Δp85, and Cl41-Akt-T308A/S473A cells. Cellular RNA was extracted and reverse transcribed by RT-PCR, as described in Materials and Methods. β-Actin was used as a loading control. Plots are mean ± SE values of three independent experiments. ∗, p < 0.05 vs Cl41 control. The pivotal role of PI3K/Akt pathway in the regulation of cell survival under physiologic and pathologic conditions has been established. It is generally accepted that PI3K/Akt promotes cell survival through phosphorylation-dependent suppression of intracellular apoptotic factors such as BAD, caspase 9, forkhead transcription factor, and IκB kinase α (17, 18, 19). However, the role of PI3K/Akt in Fas-mediated apoptosis and its control mechanisms remain unclear. In this study, we demonstrate that FasL induces Akt/PKB phosphorylation and apoptosis in epidermal Cl41 cells (Fig. 1⇑). Inhibition of PI3K and Akt by dominant-negative expression of Δp85 and Akt-T308A/S473A protects the cells from apoptosis induced by FasL (Fig. 2⇑). 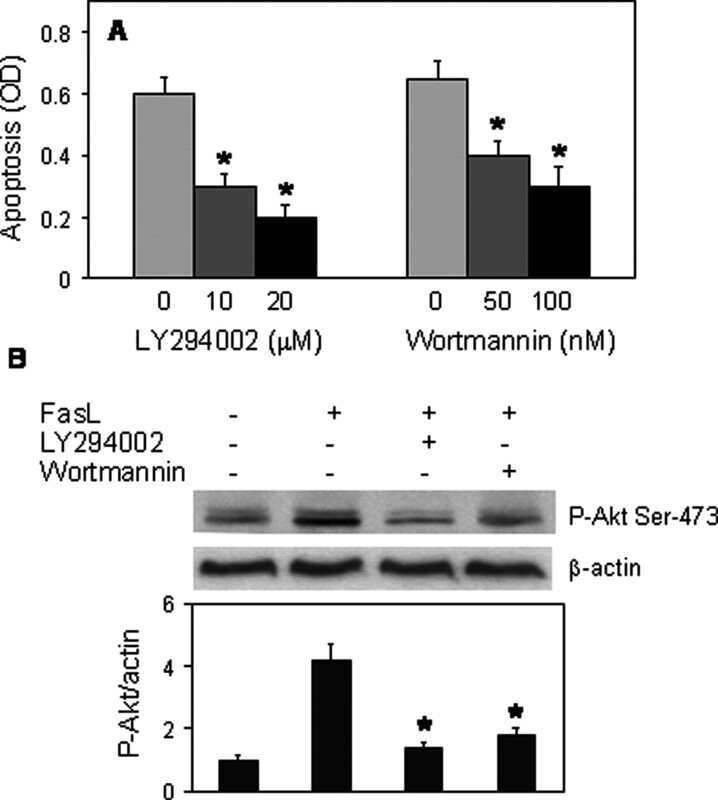 Likewise, inhibition of Akt/PKB activity by PI3K inhibitors, wortmannin and LY294002, inhibits the apoptotic effect of FasL (Fig. 3⇑). These results indicate that the PI3K/Akt pathway, in addition to its normal protective role, also plays a promoting role in Fas-mediated cell death. Previous studies indicate that PI3K is involved in the activation of Akt/PKB in various systems (16, 30, 31). However, PI3K-independent mechanisms of Akt/PKB activation have also been reported (43, 44, 45). In this study, we found that PI3K is an important upstream regulator of FasL-induced Akt activation because inhibition of PI3K by dominant-negative gene expression or by chemical inhibitors, wortmannin and LY294002, blocks Akt/PKB phosphorylation induced by FasL (Figs. 2⇑ and 3⇑). The results of this study also demonstrate that the activation of Akt/PKB by FasL requires ROS generation, and that these oxidative species play a role in FasL-induced cell death. Supporting this notion is the evidence that FasL induces ROS generation and its inhibition by the antioxidant enzymes catalase and SOD significantly inhibits Akt/PKB phosphorylation as well as apoptosis induction by FasL (Figs. 4⇑ and 5⇑). The requirement of ROS in FasL-induced Akt/PKB activation has not been demonstrated previously, and our results support previous findings identifying Akt/PKB as a redox-sensitive target for oxidant and growth factor stimulation (26, 31). 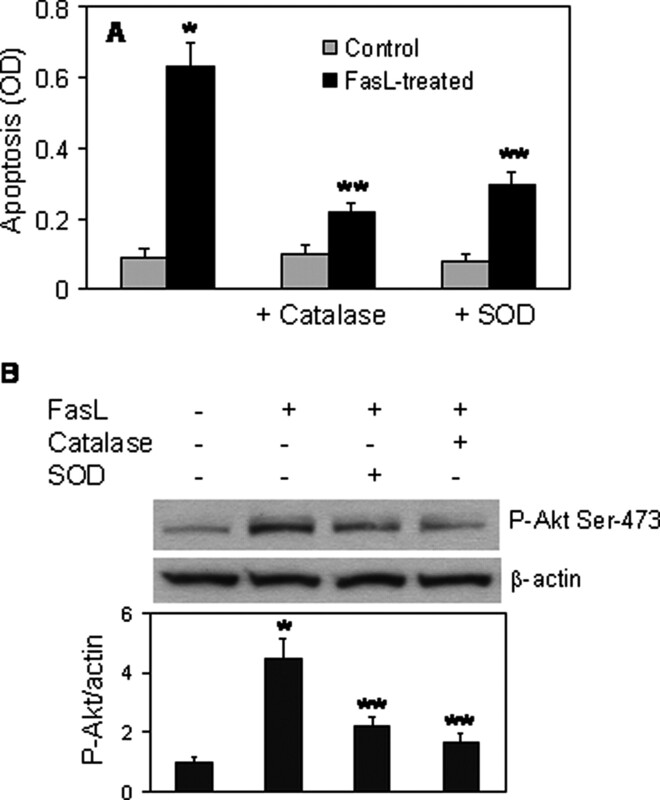 The ability of catalase and SOD to inhibit Akt/PKB activation and apoptosis induced by FasL further indicates H2O2 and O2−· as key mediators of Akt and Fas signaling. These results are consistent with previous reports identifying H2O2 as a major ROS responsible for Akt/PKB activation induced by growth factors (26) and UV irradiation (31). However, the role of O2−. in Akt/PKB signaling is controversial. In vascular smooth muscle cells, angiotensin II stimulates O2−· production by activating NADH/NADPH oxidase (46, 47), and its inhibition by diphenylene iodonium partially inhibits Akt/PKB activation (26). In contrast, O2−· production induced by UV irradiation has minimal effect on UV-induced Akt/PKB activation (31). Our results show that O2−· is produced and involved in FasL-induced Akt/PKB activation and apoptosis (Figs. 5⇑ and 7⇑). It is likely that O2−· is rapidly dismuted to H2O2, which may be the ROS that is most important in modulating Akt/PKB signaling. Indeed, H2O2 formation was observed as early as 5 min after Fas stimulation (33), suggesting that it may mediate subsequent signaling events. In many cell systems, ROS generation is regulated by Rac1 (39, 40, 41). Rac1 is involved in the activation of NADPH oxidase and is required for O2−· generation in response to various stimuli in different cell types (40, 41, 42). In the present study, we showed that Rac1 is involved in the generation of O2−· induced by FasL. Inhibition of Rac1 by dominant-negative Rac1N17 expression significantly inhibited O2−· production in FasL-treated Cl41 cells (Fig. 7⇑). However, such inhibition was not observed in resting nonstimulated cells, indicating that Rac1-mediated O2−· generation requires appropriate cell stimulation. Rac1 inhibition had a partial inhibitory effect on FasL-induced O2−· generation, suggesting that other sources of O2−· generation such as mitochondria may also be involved in the activation process. Inhibition of Rac1 by dominant-negative gene expression has been reported previously to protect cells against Fas-mediated cell death (48), although its effect on O2−· inhibition was not demonstrated. The results of this study further demonstrated the inhibition of O2−· by dominant-negative Rac1 expression and substantiate the role of this oxidative species in Fas-mediated cell death (Fig. 5⇑). As indicated earlier, O2−· can be rapidly dismuted to form H2O2, which may be a key regulator of Fas death signaling. Alternatively, O2−. can react with NO to form peroxynitrite (49). NO has been reported recently to be induced by Fas stimulation (50), and its formation of peroxynitrite is capable of generating the highly reactive ·OH radical (49). All of these ROS may act in concert to regulate Fas death signaling, and O2−· may mediate its effect either directly or indirectly through other ROS. Our results on the proapoptotic role of PI3K/Akt in Fas-mediated cell death are consistent with previous reports showing the regulation of Fas expression by PI3K/Akt pathway (24, 38), but are contradictory to some others showing the protective effect of PI3K/Akt on Fas-mediated apoptosis (21, 51). In mouse hepatocytes, activation of Akt/PKB decreases cell sensitivity to Fas-mediated cell death through an activation of NF-κB (51). Active Akt induces NF-κB transcriptional activity, but NF-κB-binding activity is unaffected. It is not known from this study whether such manipulation affects Fas expression. NF-κB is an important transcription factor of Fas receptor (52). However, the primary regulators of fas promoter by Akt do not include NF-κB, because permanently active PI3K/Akt cells still exhibit increased transcriptional activity of the fas promoter with mutated NF-κB site (38). The expression of antiapoptotic protein FLIP is also regulated by the PI3K/Akt pathway in some tumor cells, and induction of FLIP expression via Akt signaling can inhibit Fas-mediated apoptosis (21, 53). In epidermal cells, our results show that inhibition of PI3K/Akt by dominant-negative gene expression had minimal effect on FLIP expression, indicating that the regulation of FLIP by Akt is cell type specific. A similar finding was also observed in hepatocytes (52) and gastric carcinoma cells (54). These studies indicate that PI3K/Akt regulation of the Fas death pathway is complex and is cell type dependent. Fas expression has been reported to be under the regulation of PI3K/Akt (38), and inhibition of this pathway by dominant-negative gene expression attenuates Fas expression in our cell system (Fig. 6⇑). In human melanoma cells, overexpression of permanently active Akt increases cell sensitivity to death induced by FasL, but not by a nonspecific inducer, thapsigargin (38), supporting the finding of this study on Akt regulation of Fas receptor. The specificity of Fas regulation by Akt was also observed in our study, in which PI3K/Akt inhibition had no protective effect on apoptosis induced by a nonspecific apoptogen, cycloheximide (data not shown). The role of PI3K/Akt in Fas signaling was further demonstrated in this study by the ability of dominant-negative PI3K/Akt to suppress fas promoter activity and mRNA expression (Fig. 8⇑). Fas promoter activity has been reported to be negatively regulated by two functionally related oncogenes, STAT3 and c-Jun (24), which can be suppressed by Akt phosphorylation (55). Thus, activation of Akt/PKB suppresses STAT3 and c-Jun, leading to increased Fas expression. The results of this study are consistent with these findings and indicate that once the PI3K/Akt signaling is inhibited, Fas receptor expression is down-regulated and the cells become less susceptible to FasL-induced apoptosis. In summary, we have shown that in addition to its normal prosurvival role, the PI3K/Akt signaling pathway also plays a proapoptotic role in epidermal cell death induced by FasL. FasL induces rapid generation of ROS and activates PI3K/Akt. Inhibition of ROS by antioxidants inhibits Akt/PKB activation as well as apoptosis induced by FasL, indicating the redox regulation of Akt/PKB and its role in Fas-mediated cell death. The mechanism by which PI3K/Akt regulates Fas death signal appears to involve transcriptional up-regulation of Fas receptor and concomitant sensitization of the cells to FasL-induced cell death. ↵1 This work was supported by National Institutes of Health Grant HL071545. ↵3 Abbreviations used in this paper: FasL, Fas ligand; DMPO, 5,5-dimethyl-1-pyrroline-N-oxide; ESR, electron spin resonance; H2O2, hydrogen peroxide; LY294002, 2-(4-morpholinyl)-8-phenyl-4H-1-benzopyran-4-1; O2−·, superoxide anion; ·OH, hydroxyl radical; PKB, protein kinase B; ROS, reactive oxygen species; SOD, superoxide dismutase. Nagata, S.. 1997. Apoptosis by death factor. Cell 88: 355-365. Lenardo, M., K. M. Chan, F. Hornung, H. McFarland, R. Siegel, J. Wang, L. Zheng. 1999. Mature T lymphocyte apoptosis: immune regulation in a dynamic and unpredictable antigenic environment. Annu. Rev. Immunol. 17: 221-253. Nagata, S.. 1999. Fas ligand-induced apoptosis. Annu. Rev. Genet. 33: 29-55. Takahashi, T., M. Tanaka, C. I. Brannan, N. A. Jenkins, N. G. Copeland, T. Suda, S. Nagata. 1994. Generalized lymphoproliferative disease in mice, caused by a point mutation in the Fas ligand. Cell 76: 969-976. Chervonsky, A. V., Y. Wang, F. S. Wong, I. Visintin, R. A. Flavell, C. A. Janeway, Jr, L. A. Matis. 1997. The role of Fas in autoimmune diabetes. Cell 89: 17-24. Hsu, H. C., Y. Matsuki, H. G. Zhang, T. Zhou, J. D. Mountz. 2001. The Fas signaling connection between autoimmunity and embryonic lethality. J. Clin. Immunol. 21: 1-14. Viard, I., P. Wehrli, R. Bullani, P. Schneider, N. Holler, D. Salomon, T. Hunziker, J. H. Saurat, J. Tschopp, L. E. French. 1998. Inhibition of toxic epidermal necrolysis by blockage of CD95 with human intravenous immunoglobulin. Science 282: 490-493. Guan, D. W., T. Ohshima, T. Kondo. 2000. Immunohistochemical study on Fas and Fas ligand in skin wound healing. Histochem. J. 32: 85-91. Santamaria, A. B., D. W. Davis, D. X. Nghiem, D. J. McConkey, S. E. Ullrich, M. Kapoor, G. Lozano, N. Ananthaswamy. 2002. p53 and Fas ligand are required for psoralen and UVA-induced apoptosis in mouse epidermal cells. Cell Death Differ. 9: 549-560. Westendorp, M. O., R. Frank, C. Ochsenbauer, K. Stricker, J. Dhein, H. Walczak, K. M. Debatin, P. H. Krammer. 1995. Sensitization of T cells to CD95-mediated apoptosis by HIV-1 Tat and gp120. Nature 375: 497-500. Friesen, C., I. Herr, P. H. Krammer, K. M. Debatin. 1996. Involvement of the CD95 (APO-1/FAS) receptor/ligand system in drug-induced apoptosis in leukemia cells. Nat. Med. 2: 574-577. Muller, M., S. Strand, H. Hug, E. M. Heinemann, H. Walczak, W. J. Hofmann, W. Stremmel, P. H. Krammer, P. R. Galle. 1997. Drug-induced apoptosis in hepatoma cells is mediated by the CD95 (APO-1/Fas) receptor/ligand system and involves activation of wild-type p53. J. Clin. Invest. 99: 403-413. Rehemtulla, A., C. A. Hamilton, A. M. Chinnaiyan, V. M. Dixit. 1997. Ultraviolet radiation-induced apoptosis is mediated by activation of CD-95 (Fas/APO-1). J. Biol. Chem. 272: 25783-25786. Datta, S. R., A. Brunet, M. E. Greenberg. 1999. Cellular survival: a play in three Akts. Genes Dev. 13: 2905-2927. Toker, A., A. C. Newton. 2000. Akt/Protein kinase B is regulated by autophosphorylation at the hypothetical PDK-2 site. J. Biol. Chem. 275: 8271-8274. Pastorino, J. G., M. Tafani, J. L. Farber. 1999. Tumor necrosis factor induces phosphorylation and translocation of BAD through a phosphatidylinositide-3-OH kinase-dependent pathway. J. Biol. Chem. 274: 19411-19416. Rena, G., S. Guo, S. C. Cichy, T. G. Unterman, P. Cohen. 1999. Phosphorylation of the transcription factor forkhead family member FKHR by protein kinase B. J. Biol. Chem. 274: 17179-17183. Brunet, A., A. Bonni, M. J. Zigmond, M. Z. Lin, P. Juo, L. S. Hu, M. J. Anderson, K. C. Arden, J. Blenis, M. E. Greenberg. 1999. Akt promotes cell survival by phosphorylating and inhibiting a Forkhead transcription factor. Cell 96: 857-868. Madrid, L. V., M. W. Mayo, J. Y. Reuther, A. S. Baldwin, Jr. 2001. Akt stimulates the transactivation potential of the RelA/p65 subunit of NF-κB through utilization of the IκB kinase and activation of the mitogen-activated protein kinase p38. J. Biol. Chem. 276: 18934-18940. Suhara, T., T. Mano, B. E. Oliveira, K. Walsh. 2001. Phosphatidylinositol 3-kinase/Akt signaling controls endothelial cell sensitivity to Fas-mediated apoptosis via regulation of FLICE-inhibitory protein (FLIP). Circ. Res. 89: 13-19. Plas, D. R., S. Talapatra, A. L. Edinger, J. C. Rathmell, C. B. Thompson. 2001. Akt and Bcl-xL promote growth factor-independent survival through distinct effects on mitochondrial physiology. J. Biol. Chem. 276: 12041-12048. Gulbins, E., M. Hermisson, B. Brenner, H. U. Grassme, O. Linderkamp, J. Dichgans, M. Weller, F. Lang. 1998. Cellular stimulation via CD95 involves activation of phosphoinositide-3-kinase. Pflugers Arch. 435: 546-554. Ivanov, V. N., A. Bhoumik, M. Krasilnikov, R. Raz, L. B. Owen-Schaub, D. Levy, C. M. Horvath, Z. Ronai. 2001. Cooperation between STAT3 and c-jun suppresses Fas transcription. Mol. Cell 7: 517-528. Gibson, S., S. Tu, R. Oyer, S. M. Anderson, G. L. Johnson. 1999. Epidermal growth factor protects epithelial cells against Fas-induced apoptosis: requirement for Akt activation. J. Biol. Chem. 274: 17612-17618. Ushio-Fukai, M., R. W. Alexander, M. Akers, Q. Yin, Y. Fujio, K. Walsh, K. K. Griendling. 1999. Reactive oxygen species mediate the activation of Akt/protein kinase B by angiotensin II in vascular smooth muscle cells. J. Biol. Chem. 274: 22699-22704. Konishi, H., H. Matsuzaki, M. Tanaka, Y. Takemura, S. Kuroda, Y. Ono, U. Kikkawa. 1997. Activation of protein kinase B (Akt/RAC-protein kinase) by cellular stress and its association with heat shock protein Hsp27. FEBS Lett. 410: 493-498. Sonoda, Y., S. Watanabe, Y. Matsumoto, E. Aizu-Yokota, T. Kasahara. 1999. FAK is the upstream signal protein of the phosphatidylinositol 3-kinase-Akt survival pathway in hydrogen peroxide-induced apoptosis of a human glioblastoma cell line. J. Biol. Chem. 274: 10566-10570. Klotz, L. O., S. M. Schieke, H. Sies, N. J. Holbrook. 2000. Peroxynitrite activates the phosphoinositide 3-kinase/Akt pathway in human skin primary fibroblasts. Biochem. J. 352: 219-225. Wang, X., K. D. McCullough, T. F. Franke, N. J. Holbrook. 2000. Epidermal growth factor receptor-dependent Akt activation by oxidative stress enhances cell survival. J. Biol. Chem. 275: 14624-14631. Huang, C., J. Li, M. Ding, S. S. Leonard, L. Wang, V. Castranova, V. Vallyathan, X. Shi. 2001. UV induces phosphorylation of protein kinase B (Akt) at Ser473 and Thr308 in mouse epidermal Cl 41 cells through hydrogen peroxide. J. Biol. Chem. 276: 40234-40240. Denning, T. L., H. Takaishi, S. E. Crowe, I. Boldogh, A. Jevnikar, P. B. Ernst. 2002. Oxidative stress induces the expression of Fas and Fas ligand and apoptosis in murine intestinal epithelial cells. Free Radic. Biol. Med. 33: 1641-1650. Devadas, S., J. A. Hinshaw, L. Zaritskaya, M. S. Williams. 2003. Fas-stimulated generation of reactive oxygen species or exogenous oxidative stress sensitizes cells to Fas-mediated apoptosis. Free Radic. Biol. Med. 35: 648-661. Huang, C., W. Y. Ma, Z. Dong. 1996. Requirement for phosphatidylinositol 3-kinase in epidermal growth factor-induced AP-1 transactivation and transformation in JB6 P+ cells. Mol. Cell. Biol. 16: 6427-6435. Chan, H., D. P. Bartos, L. B. Owen-Schaub. 1999. Activation-dependent transcriptional regulation of the human fas promoter requires NF-κB p50–p65 recruitment. Mol. Cell. Biol. 19: 2098-2108. Colburn, N. H., B. F. Former, K. A. Nelson, S. H. Yuspa. 1979. Tumor promoter induces anchorage independence irreversibly. Nature 281: 589-591. Ye, J., S. Wang, S. S. Leonard, Y. Sun, L. Butterworth, J. Antonini, M. Ding, Y. Rojanasakul, V. Vallyathan, V. Castranova, X. Shi. 1999. Role of reactive oxygen species and p53 in chromium (VI)-induced apoptosis. J. Biol. Chem. 274: 34974-34980. Ivanov, V. N., M. Krasilnikov, Z. Ronai. 2002. Regulation of Fas expression by STAT3 and c-Jun is mediated by phosphatidylinositol 3-kinase-AKT signaling. J. Biol. Chem. 277: 4932-4944. Sulciner, D. J., K. Irani, Z. X. Yu, V. J. Ferrans, P. Goldschmidt-Claermont, T. Finkel. 1996. Rac1 regulates a cytokine-stimulated redox-dependent pathway necessary for NF-κB activation. Mol. Cell. Biol. 16: 7115-7121. Sulciner, D. J., Z. X. Yu, V. J. Ferrans, K. Gutkindm, K. Irani, P. Goldschmidt-Clermont, T. Finkel. 1996. Rac1 regulates reactive oxygen species generation in fibroblasts. Biochem. J. 318: 379-382. Deshpande, S. S., P. Angkeow, J. Huang, M. Ozaki, K. Irani. 2000. Rac1 inhibits TNF-α-induced endothelial cell apoptosis: dual regulation by reactive oxygen species. FASEB J. 14: 1705-1714. Chen, X. L., Q. Zhang, R. Zhao, X. Ding, P. E. Tummala, R. M. Medford. 2003. Rac1 and superoxide are required for the expression of cell adhesion molecules induced by tumor necrosis factor-α in endothelial cells. J. Pharmacol. Exp. Ther. 305: 573-580. Franke, T. F., D. R. Kaplan, L. C. Cantley. 1997. PI3K: downstream AKTion blocks apoptosis. Cell 88: 435-437. Moule, S. K., G. I. Welsh, N. J. Edgell, E. J. Foulstone, C. G. Proud, R. M. Denton. 1997. Regulation of protein kinase B and glycogen synthase kinase-3 by insulin and β-adrenergic agonists in rat epididymal fat cells: activation of protein kinase B by wortmannin-sensitive and -insensitive mechanisms. J. Biol. Chem. 272: 7713-7719. Sable, C. L., N. Filippa, B. Hemmings, E. Van Obberghen. 1997. cAMP stimulates protein kinase B in a wortmannin-insensitive manner. FEBS Lett. 409: 253-257. Konishi, H., H. Matsuzaki, M. Tanaka, Y. Ono, C. Tokunaga, S. Kuroda, U. Kikkawa. 1996. Activation of RAC-protein kinase by heat shock and hyperosmolarity stress through a pathway independent of phosphatidylinositol 3-kinase. Proc. Natl. Acad. Sci. USA 93: 7639-7643. Griendling, K. K., C. A. Minieri, J. D. Ollerenshaw, R. W. Alexander. 1994. Angiotensin II stimulates NADH and NADPH oxidase activity in cultured vascular smooth muscle cells. Circ. Res. 74: 1141-1148. Brenner, B., U. Koppenhoefer, C. Weinstock, O. Linderkamp, F. Lang, E. Gulbins. 1997. Fas- or ceramide-induced apoptosis is mediated by a Rac1-regulated activation of Jun N-terminal kinase/p38 kinases and GADD153. J. Biol. Chem. 272: 22173-23321. Rubbo, H., V. Darley-Usmar, B. A. Freeman. 1996. Nitric oxide regulation of tissue free radical injury. Chem. Res. Toxicol. 9: 809-820. Chanvorachote, P., U. Nimmannit, L. Wang, C. Stehlik, B. Lu, N. Azad, Y. Rojanasakul. 2005. Nitric oxide negatively regulates Fas (CD95)-induced apoptosis through inhibition of ubiquitin-proteasome mediated degradation of FLIP. J. Biol. Chem. 280: 42044-42050. Ushio-Fukai, M., A. M. Zafari, T. Fukui, N. Ishizaka, K. K. Griendling. 1996. p22phox is a critical component of the superoxide-generating NADH/NADPH oxidase system and regulates angiotensin II-induced hypertrophy in vascular smooth muscle cells. J. Biol. Chem. 271: 23317-23321. Hatano, E., D. A. Brenner. 2001. Akt protects mouse hepatocytes from TNF-α- and Fas-mediated apoptosis through NF-κB activation. Am. J. Physiol. 281: G1357-G1368. Panka, D. J., T. Mano, T. Suhara, K. Walsh, J. W. Mier. 2001. Phosphatidylinositol 3-kinase/Akt activity regulates c-FLIP expression in tumor cells. J. Biol. Chem. 276: 6893-6896. Osaki, M., S. Kase, K. Adachi, A. Takeda, K. Hashimoto, H. Ito. 2004. Inhibition of the PI3K-Akt signaling pathway enhances the sensitivity of Fas-mediated apoptosis in human gastric carcinoma cell line, MKN-45. J. Cancer Res. Clin. Oncol. 130: 8-14. Kwon, T., D. Y. Kwon, J. Chun, J. H. Kim, S. S. Kang. 2000. Akt protein kinase inhibits Rac1-GTP binding through phosphorylation at serine 71 of Rac1. J. Biol. Chem. 275: 423-428.